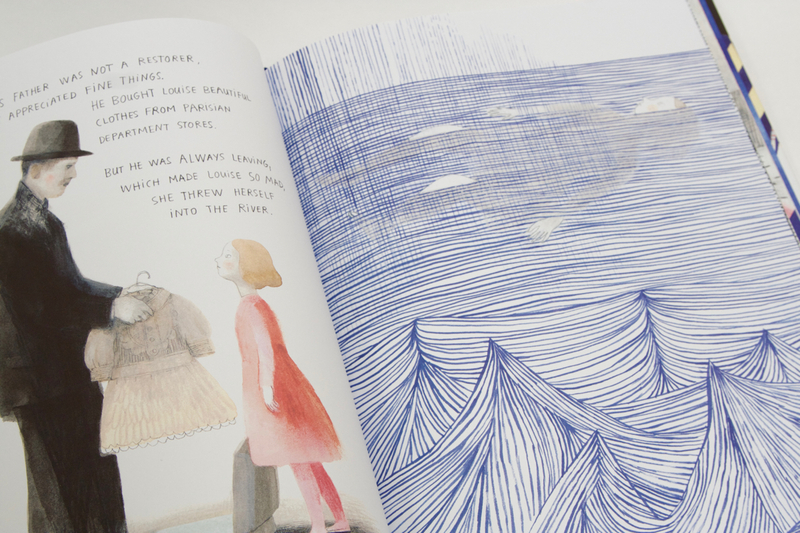 Amy Novesky’s nuanced text paired with Isabelle Arsenault’s rich illustrations are a stunning way of introducing children to the distinct visual vocabulary of French-born artist Louise Bourgeois. In the recent past, books about art and artists for children were worthy but dull offerings that tried to take the ideas of some of the world’s most creative thinkers and simplify them beyond recognition. 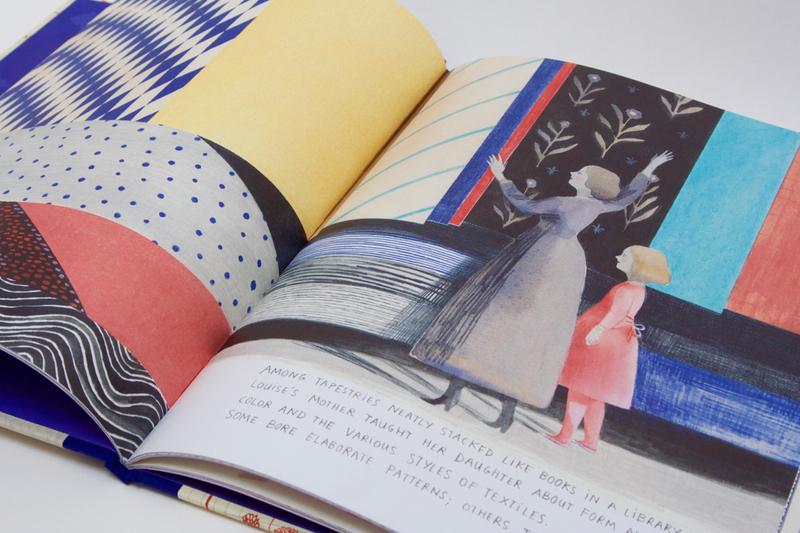 Now, with art publishers and trade publishers alike embracing beautifully illustrated books as a way of inspiring children to engage with the visual arts, we are seeing increasing numbers of exciting art books for children. 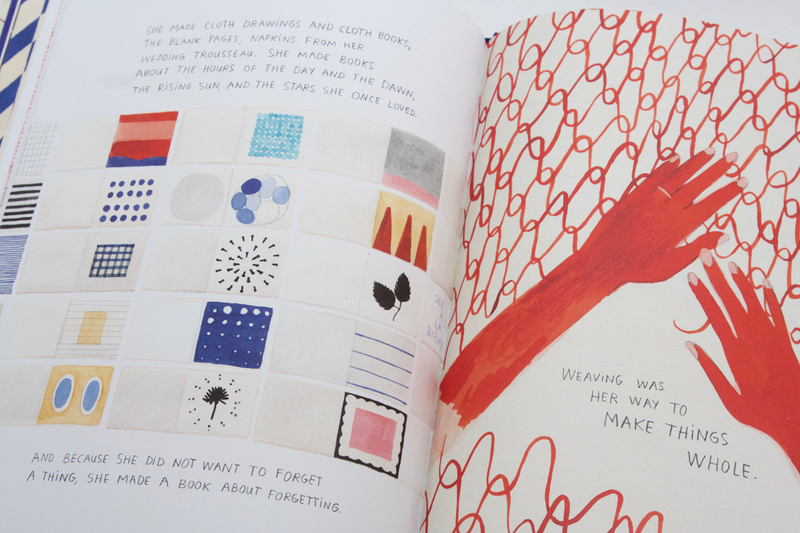 Cloth Lullaby: The Woven Life of Louise Bourgeois is no exception: it is a stunning and beautiful book that conveys some of what Louise Bourgeois’ life and work was about by expressing it creatively, using both the textual and visual vocabularies the artist used herself. On first reading, Cloth Lullaby will seem very ‘grown-up’ to some. Amy Novesky has written a poetic prose that is sophisticated and nuanced like art itself, and instead of dumbing down, she provides young readers with a step up into the mysterious world of being an artist. The story provides a broad sweep of Bourgeois’ life and hones in on two particular themes that young readers will relate to: the mother / child relationship, which Louise Bourgeois was fascinated by throughout her lifetime; and the idea of weaving or creating artworks to make sense of the world around us. As poetic as it may be, Novesky’s text is evidently informed and well-researched, and she doesn’t shy away from using precise vocabulary. In this sense, the book expects a level of inquisitiveness from its readers whose minds will be tickled by technical terms relating to textile weaving as well as quotes from Bourgeois’ own writings, and will appeal to children, teenagers and adults alike. Isabelle Arsenault’s illustrations have a visceral effect and immediately immerse the reader in the world of Louise Bourgeois. Drawing predominantly on Bourgeois’ drawings and textile works, Arsenault demonstrates how visuals can be expressive, communicative and representative of ideas that in some aspects are too ambiguous to explain in words. Arsenault’s wave-like illustration in blue ink based on Throbbing Pulse, 1944, at once represents the ebb and flow of the river Bourgeois lived by as a child; the soothing effect that drawing abstract, geometric patterns had on her; it acts as a symbol of water, which for the artist represented the unconscious mind; while also familiarising readers with Bourgeois’ distinct visual vocabulary. 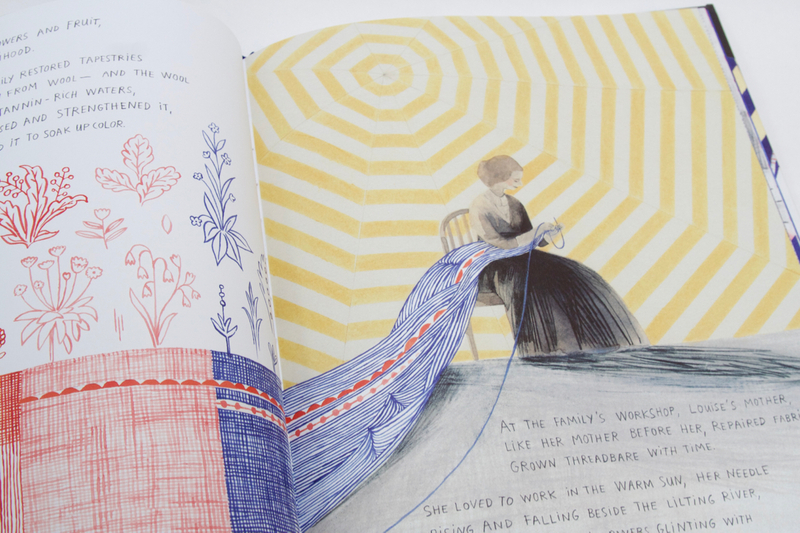 Cloth Lullaby is a highly memorable reading experience that young readers will be able to draw on in years to come when they discover Louise Bourgeois’ work for themselves. Novesky’s rich vocabulary paired with Arsenault’s exquisite illustrations make for an intelligent and inspiring celebration of the life and art of one of the world’s most original modern artists. About the author: Anna Ridley is the Commissioning & Development Editor, Children’s Publishing at Thames & Hudson, and founder of Look/Book, a website reporting on the art of children’s books. So beautiful, thanks for the review!